Suddenly, I thought I wanted to build a Job Board site.But it will be not easy to make like other corporate or blog website.It will need more time and effort to do this.Especially these types of sites are a lot of functions Like the customer’s demand.In addition to this kind of site, you have to prepare a list of custom made files, where you can describe the newly recorded work with all the necessary details, and you need a customized search widget so your users can get work easily. Hope to discuss some excellent job board WordPress themes in the following post, which is very good to help you build your job board site. Jobify is Most Popular WordPress Job Board Theme.This theme is going to huge sales online market.Also, the theme offers Responsive Design,Beautiful & Clean, and great support,tons of features with.The theme is integrated with Resume Manager plugin,WP Job manager plugin,also have WooCommerce Paid Listings which allows creating custom job packages. Jobmonster is an ideal theme to run a job-based site.It has a fully responsive design.the theme also offers clean coding and function,customization,Easy installation,Front-end Job Submission, WooCommerce Integrated Job Posting Pricing Plan and much more.The theme also offers Employer Management Dashboard which let’s manage jobs,Employer edit Company profile,view and response to applications from candidates. Chimp Studio makes an awesome wordpress theme named JobCareer.The theme is fitting for listing your jobs and also easy installation and customization.JobCareer theme has an option that filter and search jobs,build their resumes online,search jobs using geolocation and mores.this theme has a built-in payment gateway for the transaction. WPJobus is ideal Job Board and Resumes WordPress Theme.The theme doesn’t depend on any additional 3rd party plugins.It also has greater feature like of Job Offers and Resumes,100+ built-in fields for describing in detail Companies Profiles,Directories with Google Maps and much more. Workscout is beautiful and integrated WordPress Jobboard theme extended with several extension and plugins.The theme has many employment-related features as well as lots of other useful tools like Visual Composer,WP Job Manager, Resume Manager,WC Paid Listings, Revolution Slider, and others.it easy to use for candidates to find related jobs. JobSeek is a clean and user friendly job board WordPress theme.It has various option providing the opportunity for both candidate and employers.It allows to input job details, including job description and location, and likewise include points of interest about their company.The theme JobSeek is built by Filterable Job Listings,WP job manager, Bookmarks, WooCommerce Paid Listings. 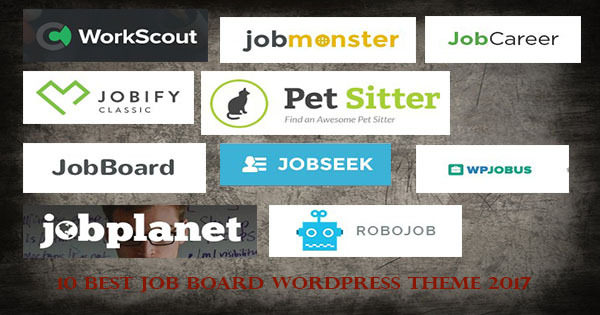 Job Planet is a highly customizable clean and modern WordPress theme.The main features of the theme are functioning of the site without buying any other plugins.It is an ideal theme for employment agencies,recruiters and employment listing site.The theme has social login option mean users can register and login to their social network sites. When you have a need to pet related employment opportunities site then Petsitter wordpress theme is ideal for you.it is not only pet related occupation site you will also use for other requirements.It has popular redux theme options.For easier to customize it have over 40 shortcode option,600+ google fonts option, choose from an unlimited range of colors. Robojob is a WP job manager powered WordPress theme.It’s an awesome Job listing website and also compatible with Woocommerce.The theme includes some premium plugin like of Resume Manager plugin absolutely free of cost.Robojob also comes with powerful shortcodes that help you to add testimonials,job listings,page designs,resumes and much more.